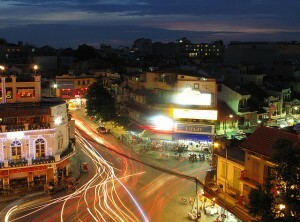 Hanoi, the Vietnamese capital, is the beating heart of Vietnamese life and culture, and one of the most exciting travel destinations in Asia. It’s well known that many of the most interesting local delicacies in Asia can be sampled on the street, and in Hanoi the situation is no different. While the modern past of the city is just as cosmopolitan as any other major capital in the world, there are little corners of the old Hanoi left where you can have a taste of life in the city decades ago, as well as its present rhythm and culture. So if you’re ready to experience the Vietnamese capital’s amazing cuisine, here’s a guide to street food in Hanoi. Noodle dishes, and more specifically noodle dishes are some of the most typical dishes you can find at street stalls in Hanoi. 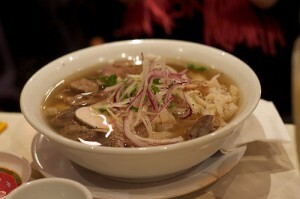 Pho Bo, well known abroad, is a local favorite. Pho comes in thousands of varieties with different types of broth, noodles and toppings, but in all cases, the broth are aromatic and spicy, and it is usually topped with paper-thin slices of beef. There is no shortage of pho boots in Hanoi, and some of them open as early as 6 AM, and keep open until the wee hours of the morning. Various rolls stuffed with meat and vegetables are also a common street food. The delicate, thin rice pancakes called bahn cuon are rolled with minced pork and mushrooms, and cut with scissors into bite-sized portions. Not only are they delicious snacks, but also interested to watch as they are being prepared. Another delicious roll-type of dish is the pho cuon, made of rolled sheets of pho noodles filled with pork and fresh herbs and greens and dipped into mild fish sauce. 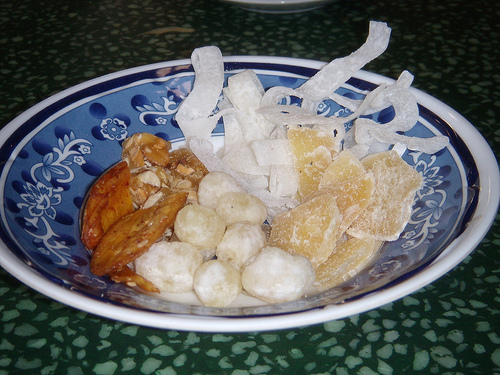 Sweet snacks can easily be found on the streets and most of the time nibbled on your way somewhere. Bahn toi tau is a sticky, messy and delicious rice ball stuffed with coconut, green bean paste or black sesame paste. For something light, try the tao pho, a soy bean custard served with soy milk and ice, which can be slurped with a straw from a plastic cup. Mia Da is a summertime treat made of sugarcane juice with lime juice over ice. If you happen to visit Hanoi during those few weeks in the year when the weather turns from tropical into wet and miserable, a serving of lau will instantly brighten up your day. Lau is a type of Vietnamese hotpot usually served communally or shared among friends. When your order lau, you get a big pot of broth on a hot burner and a tray of things to put in it, like seafood, taro root, vegetables, noodles. You drop your ingredient into the broth, wait for it to cook, fish it out and eat it.